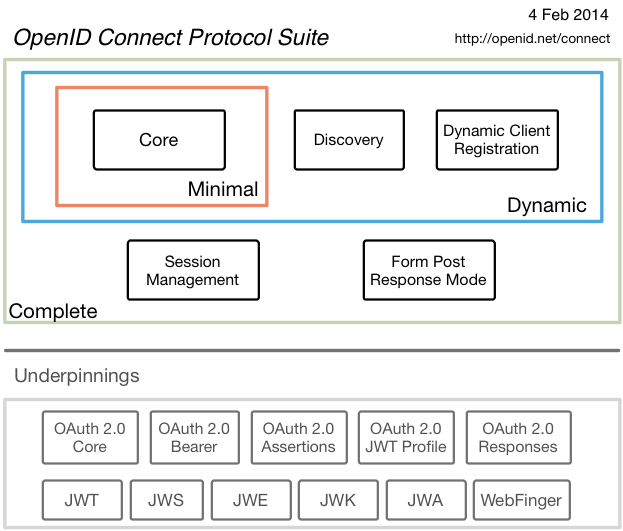 The OpenID Connect specifications, implementer’s guides, and specifications they are built upon are shown in the diagram below. Click on the boxes in the diagram to view the specification. The easiest way to monitor progress on the OpenID Connect 1.0 Specification is to join the mailing list at http://lists.openid.net/mailman/listinfo/openid-specs-ab. Please note that while anyone can join the mailing list as a read-only recipient, posting to the mailing list or contributing to the specifications requires the submission of an IPR Agreement. More information is available at http://openid.net/intellectual-property. Make sure to specify the working group as “OpenID AB/Connect”, because this group is a merged working group and both names must be specified. For more details on participating, see the OpenID Connect Working Group Page. The Libraries page lists libraries that implement OpenID Connect and related specifications. Interop testing for OpenID Connect implementations is under way. If you are interested in participating in the interop activities, join the OpenID Connect Interop mailing list. Final OpenID Connect specifications were launched on February 26, 2014. The certification program for OpenID Connect was launched on April 22, 2015. Final OAuth 2.0 Form Post Response Mode Specification was approved on April 27, 2015. OpenID Certification for RPs was made available to all in August 2017. Implementer’s Draft of OpenID Connect Federation Specification Approved on August 7, 2018.